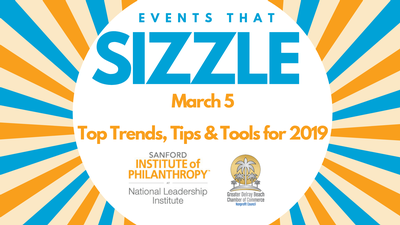 In partnership with the Sanford Institute of Philanthropy at National Leadership Institute (SIP at NLI), join in a discussion dedicated to the latest event trends, tips, tech tools, and event follow-up best practices to make your next event SIZZLE! We have an exciting panel of event guru's from all corners of the event management world. Our “Power Panel” of diverse experts will bring you personal insights and real-life stories on the many ways they have imagined, created and managed successful events. 12:00 pm – 12:15 pm – Introduction and Presentation: "Events! What's Hot, What's Not"
12:15 pm – 12:30 pm – Table Discussion & Sharing: "What's Your Hottest Event Tip/Trick?" 12:30 pm - 1:15 pm - Panel Discussion: "Events That SIZZLE"
All nonprofit professionals are encouraged and welcome to attend! Please feel free to share this opportunity with colleagues and your board members. Make sure to bring your business cards for great networking and raffle opportunities! Cost: Complimentary for Chamber Members; $10 for Future Chamber Members. Lunch is provided by SIP at NLI! Free for all Delray Chamber Nonprofit members; For-profits (Friends of the Nonprofits) may attend for a $10 donation toward lunch. Future Nonprofit Members may also attend for $10.